Behind the Scenes in the War to Repeal "Don't Ask, Don't Tell"
Discharged in 2002 from the US Army under the provisions of “Don’t Ask, Don’t Tell,” Alexander Nicholson was shocked to learn there was no group advocating DADT’s repeal that was reaching out to active military or veterans organizations. Nicholson believed the repeal effort needed spokespersons who understood military culture, who could talk about DADT’s impact on those who serve to those who serve and served. Someone like him. From this idea Servicemembers United, the largest organization for gay and lesbian servicemembers, was born. Nicholson and several others who had been discharged under DADT toured the United States, where they spoke at American Legion posts, on radio talk shows, and at press conferences across the South and on both coasts. Surprised at the mostly positive reception that the tour provoked, Nicholson and Servicemembers United were propelled to the forefront of the DADT repeal fight. In time Nicholson became the only named plaintiff in the successful lawsuit that ordered the policy overturned, forcing the US Congress to act. 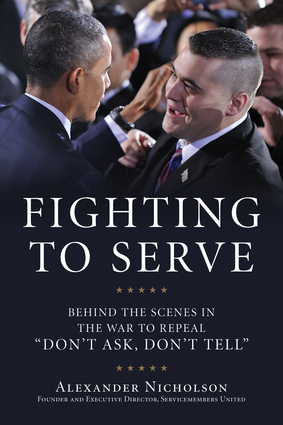 Fighting to Serve gives a no-holds-barred account of the backstage strategies and negotiations, revealing how various LGBT organizations, the Congress, the Pentagon, and the White House often worked at cross purposes. But in the end, it was the pressure brought by active veterans, a court ruling out of California, and a few courageous senators, representatives, and military leaders that brought the destructive policy to an end. 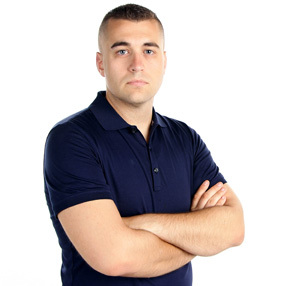 Alexander Nicholson is the founder and executive director of Servicemembers United and was personally engaged with every aspect of the “Don’t Ask, Don’t Tell” repeal fight—the grassroots, the media, the US Congress, the administration, the Pentagon, and the courts.